The Australian head of state, a retired army general, has told an Australian reporter that when he was placed next to President Vladimir Putin (lead image, centre) during the centenary World War I armistice ceremonies in Paris on Sunday, he was sorry protocol disallowed his striking the Russian president . 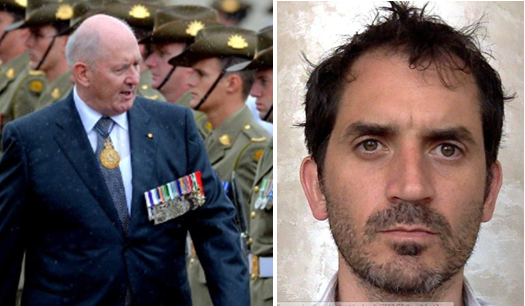 “It was an uncomfortable position to be in,” Sir Peter Cosgrove (lead image, right), the Australian Governor-General, led a reporter for Sydney and Melbourne newspapers to publish. “But then, someone had to sit there, and it was not the time or place for shirtfronting.” Shirtfronting is an Australian football term for a violent charge into the chest of an opponent; it’s outlawed by the rules of the game. Left: Sir Peter Cosgrove, the Queen’s Governor-General of Australia since 2014. According to his authorized biography, he won the Military Cross when as a junior army officer in the Vietnam War he killed two Vietnamese and captured three weapons and four packs of rice. Right: Nick Miller, Europe Correspondent for the Sydney Morning Herald and Melbourne Age. Since taking the US side in the Ukraine following the putsch of February 2104, Australian military officers and politicians have repeatedly made hostile remarks about Putin and the Russian military. They have also devised plans to send Australian troops to fight in eastern Ukraine. Australian special forces have been deployed in Syria to aid the anti-regime forces against Russia and the Syrian Government. For the Australian Government’s justification of its operations in Syria, read this. In each case of Australian threats of violence against Russian officials, the Australian politicians most threatening verbally have swiftly lost power, either by being deposed by their party colleagues or voted out of office by their constituents. The Australian intelligence agencies and federal police have been more reticent. In classified papers sent to government ministers, they refuse to confirm that the shoot-down of Malaysia Airlines Flight MH17 in July 2014 was a Russian military or Russian-backed terrorist operation. For details, read this. The Australian Federal Police (AFP), which is part of the Joint Investigation Team (JIT) gathering evidence on the shoot-down with Dutch, Ukrainian, Belgian and Malaysian representatives, has testified in Australian coroner’s court hearings on the Australian victims that the evidence was lacking to identify and prosecute those who had fired the missile; read more. At the same time, the Australian media have ignored the secret Australian intelligence assessments; they have not reported the Malaysian Government’s public rejection of the claims of Russian culpability. The Australian state broadcaster and the local newspapers have also ignored the detailed round of evidence exchanged publicly between the JIT and the Russian Defence Ministry between May and September. The Australian police commander at the JIT, Jennifer Hurst, also acknowledged during the briefing that the JIT was unable to answer key questions about the two missile parts. She “urge[d] the public to think about answering three specific questions about both rocket components found on the crash site. 1.Do you recognize the handwriting of the number on the venturi? 2.Do you have information about the numbers on the venturi and the casing? Or do you know anyone who knows about the meaning of those numbers? 3.Do you know yourself, or do you know anyone who knows to which unit this missile was delivered? Left: AFP Commander Jennifer Hurst at the JIT briefing on May 24, 2018; behind her the venturi (exhaust nozzle) and casing the JIT has displayed of the missile which downed MH17. Right: Russian Army Lieutenant General Nikolai Parshin briefing the press on September 17 with the evidence that the records of the JIT’s missile parts proves they had been delivered to the Ukrainian Army shortly after manufacture in 1986, and remained under Ukrainian control when fired. For details of this evidence, watch the briefing. For an independent assessment of the JIT claims, read this. The JIT concluded its May 2018 report by saying the evidence “raises questions, such as the question to what extent the relevant Brigade itself was actively involved in the downing of flight MH17 on 17 July 2014. An important question, into which the JIT is still investigating.” The Russian Defence Ministry followed four months later with its evidence that the JIT’s claims prove the fatal missile was fired by the Ukrainian military. Note: In the lead image, Cosgrove is at the right of the picture. To his right, in order, Putin; French President Emmanuel Macron’s wife Brigitte; German Chancellor Angela Merkel; US President Donald Trump and his wife Melania. 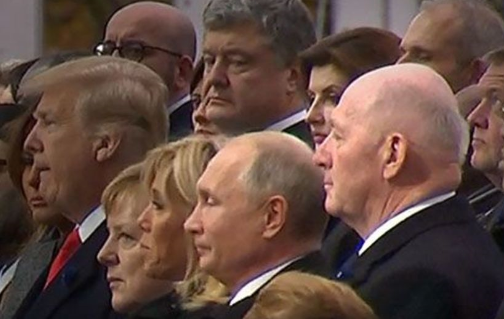 In the rear row, looking daggers at Putin, is Ukrainian President Petro Poroshenko. In the Kremlin photographic record of the sit-down Elysée Palace repast, Putin was seated at the main table, opposite Macron, between the President of the European Commission Jean-Claude Juncker and the UN Secretary-General Antonio Guterres. The Australian was nowhere to be seen. In the Paris Peace Forum, Putin was seated between Merkel and Canadian Prime Minister, Justin Trudeau. By then Cosgrove was at his embassy telling his tale to a reporter.